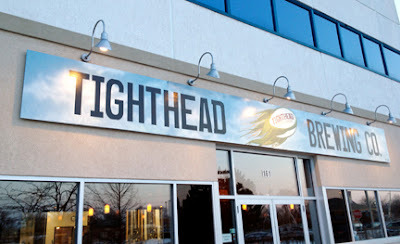 Bruce Dir, Owner and Master Brewer of Tighthead Brewing Company in Mundelein started out as a homebrewer, judging and organizing homebrew competitions, researching beer history and it became a clear passion. He spent 20 years in Corporate America, making a good living but not necessarily loving it. “I had always wanted to have my own brewery as most homebrewers dream of”, says Bruce, “So when I lost my job a few years ago, I started thinking more seriously about pursuing it, with the support of my wife Molly”. The name Tighthead comes from a position Bruce played in rugby, a “tighthead prop” which is a position in the scrummage. He played for about 14 years and says the name is really just a corporate name, the beers have their own names and stories rather than an overall rugby theme. Once Bruce knew owning a brewery was what he wanted to do, he enrolled in the 7 week Siebel course and finished the Associates Degree. “I was working with a friend who was brewing at Flatlanders. He let me come in and hang out on brew days so I was able to get the hands on experience while I was in the planning stages for Tighthead”, says Bruce. He began production in 2011 with the help of Head Brewer, Billy Oaks. Right now Tighthead is draft only and distributing kegs to about 120 bars across Lake, Cook and McHenry Counties. “My business plan all along was to start packaging in year two, and here we are. I’m putting together the plans for equipment to see what it’s going to look like and how to finance it. When we go to packaging we’re hoping to double our base following. There are so many places that just don’t have enough taplines, so bottles or cans will be huge. We have a huge boating and golfing community out here, so cans would be ideal for those reasons as well as beer quality and cost”, says Bruce. They’ve launched with three core offerings - the Irie IPA, Comfortable Blonde and Scarlet Fire Red Ale, with a number of other “seasonal” offerings including some barrel-aged and cask batches. Tighthead is excited to be more involved in Chicago Craft Beer Week this year, working on some specials at the Tap Room as well as tap takeovers at the craft bars they distribute to, getting the northern suburbs engaged. We're excited to see them in the city as well. The list of events are below. In addition they’ll be putting on the Second Annual Mundelein Craft Beer Festival in June. Last year marked the first in the brewery’s parking lot, with over 850 people in attendance and 22 breweries represented. 400 of the 850 people were walkups making it hard to plan, but a big learning experience. “We worked closely with the Village and Mundelein Community Connections, a downtown redevelopment group for the downtown area, giving us access to some of the Village resources, which was very beneficial. We’ve got a couple bands lined up already and are hoping for 35 breweries and 1,300 people”, says Bruce. They’re working with the Chicago Brew Bus on some shuttles from the Libertyville Metra station, to be more accessible to people coming in from the city.